Images fail to describe the beauty of the sand caves or The Sandhutsche, which has rocks up to three meters high and the caves carved by people into the stone make you feel as though you have entered an all together a different world. 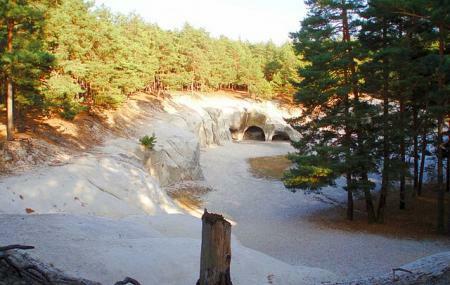 The caves are a natural monument at Blankenburg in the Heers forest area. The beauty straight from the woods comes alive when your eyes see the breath-taking sights. A hiking destination which is one on the have- to list of all the hiking enthusiasts. Be ready to witness beauty straight from the fairy tale books. Want to plan a DIY trip? Use Blankenburg trip planner for the same. Hotels like Hotel Garni Haus Sonneneck, Pension Roseneck and Harz Resort Waldesruh will solve your problem of where to stay in Blankenburg. Curated Blankenburg vacation packages await! Book the best ones and start turning your dream into reality.Discover various ways for how to reach Blankenburg and complete the booking by choosing your mode of transport. Love this? Explore the entire list of places to visit in Blankenburg before you plan your trip. Fancy a good night's sleep after a tiring day? Check out where to stay in Blankenburg and book an accommodation of your choice. How popular is Sandhohlen Im Heers? People normally club together Fliegerdenkmal and Rappbodetalsperre while planning their visit to Sandhohlen Im Heers. Was great to stumble across this delightful sandstone part in the forest. Complete with caves. I was hoping the caves would be deeper but most are just a few metres deep. Some interesting carvings in the stone along with the usual names being carved too but certainly nice to be there. Total überraschendes Highlight beim Wandern. Eben ist man noch in tiefen Wald, dann öffnet sich der Wald auf mehreren hundert Metern und der Boden wechselt auf weichen Sand wie am Strand. Die Höhlen selber sind beeindruckend, wenn auch nicht also zu tief. Tolle Sandhöhlen aber, warum gibt es Menschen die ihren Namen oder irgendwelche Zeichen ritzen müssen. Mal zu schweigen von den ganzen Schmierereien an den Wänden. Wer das macht müsste Strafen zahlen für solche Dinge und nicht nur 100 dafür müsste es 4 stellige Strafen geben für die Zerstörung von solchem Kulturgut! Einfach eine Schande so einen historischen Ort zu verschandeln.